Because the road conditions in Botswana canWe do recommend clients undertake a 4×4 driving course before a self drive safari: find out about our driver training programme, now available in Maun. For the latest information about road conditions in Botswana and the areas of Southern Africa you are planning to travel you can follow us on Facebook or twitter. Below is some of the basic information you might need about general road conditions, the types of roads you may encounter and driving information on your self drive safari. Tar – Tarmac roads in Botswana are generally good but watch out for the occasional pothole. Be extremely alert for animals on the roads, and do not drive at night. Drive slowly past all animals and be particularly aware of livestock and wildlife in the thick bush or grass next to the roads. Gravel – Keep to a reasonable speed as there may be rutted sections or potholes. Heavy braking on loose gravel can cause the vehicle to ‘aquaplane’. Be vigilant for wildlife and livestock which may run across the road without warning. 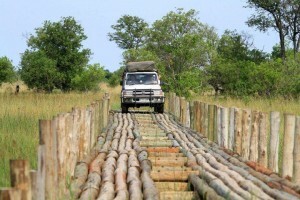 Sand – Most sand roads are traversed easily in high range 4×4. In the hot months it may be necessary to use low range 4×4 for short distances. The secret to sand driving is to lower the tyre pressure to create a bigger ‘footprint’. Once your tyres are the correct pressure the vehicle moves easily through thick sand, but be sure to re-inflate your tyres when back on hard surfaces. 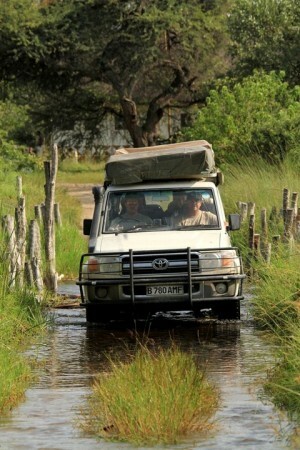 Mud – During the rainy season (November-April) some of the roads in Botswana become impassable due to the mud, also known as black cotton soil. Avoid it at all costs – if you get stuck you won’t be able to dig yourself out and if you are in a remote area you could stay there for weeks. Look to see if previous passersby have made a diversion around the problem section. If so, follow it. Water – Water crossings can be deeper than you think. Do not attempt to drive through any water crossing without first walking through it –check carefully for hippos and crocodiles. Our vehicles’ manufacturers specify they can cross water crossings to just above the wheels. There is no fuel as you head through the bush between Maun and Kasane. In an absolute emergency the lodges may be able to provide you with food or fuel – but at a greatly inflated price and usually only after seeking permission from headquarters in Maun. . Rakops often runs out of fuel so don’t depend on it.